The new year has started a pace – in fact Christmas for all seems like a distant memory. 2019 will be another historic year for the school. This year we will be opening our doors to even more students by formally admitting boys to the Sixth Form for the first time. Whilst the teaching staff have taught co-educational Sixth Form lessons for almost two decades, this will be the first time that the whole Sixth Form experience will be driven by our school. We continue to try to define the 21st Century Grammar School, a school where we want to develop bright young people to influence and lead the communities of the future. We want to provide and educational experience which nurtures individuals, challenges people to aspire to their personal best in a community where exceptional things can become an everyday occurrence. Our Sixth Form must be the pinnacle of this provision. In my last update I thanked Laura Bailey and her team for the exceptional job they did overseeing student leadership in the school. I am delighted to introduce Aroha, Mea, Smrami, Alice and Tiegan our new Senior Student Leadership Team. This week they have led assemblies and have set up a challenge calendar encouraging all students to develop themselves this year. They have given us all a reality check by showing us a stimulating film about how to be Miserable and Unhappy in our lives. It is well worth a watch click here. They are an able and enthusiastic group of student leaders and they are excited about developing the priorities for all of our student leaders across the school. Over the coming weeks they are preparing a Student School Development Plan which they will share with the school, governors and of course, parents. Next week we welcome our partner school from South Korea. Students and staff from Hanbit High in Paju will be joining us as the first leg of a formal exchange. The students from Hanbit are so excited they have even prepared a small video introducing themselves to the school. You can see this if you go to any of our social media platforms. The exchange is part of our broadening horizons in the Sixth Form and the Korean students will be at our Open Evening to tell our Year 11 and prospective students all about it. This week 30 girls began their training to represent Non-Government Organisations at the Commission on the Status of Women in New York this March. Next week they will be joined by students from Colyton School in Devon to participate in United Nations training. We have been working with our colleagues at Serene Communications to create opportunities for young people from outside of Gloucestershire to participate at international conferences as the voice of young people in the UK. Year 9 Science lessons have been focusing on the excellent Famelab competition. Merging public speaking with a love of science, the competition has produced 10 class winners who will compete in a final in front of a panel of judges, parents and Year 8 on Friday 25 January. The winner will go on to represent Stroud High School at the final hosted by the Cheltenham Science Festival for Secondary Schools across Gloucestershire. Congratulations to the following girls who will be competing in the final: Christella, Harriet, Isabel, Jahoor, Maisie, Orla, Rebekah, Sydney and Tosca. This week Year 9 have been undertaking career workshops with our colleagues from Stroud College. We have welcomed over 20 MFL teachers onto the site for ICT and language teaching training and we have also lead and hosted a training day for language teachers in association with the Sir Thomas Riches Teaching School Alliance. Teaching staff have also been enjoying reading their first bespoke teaching and learning magazine. Created to inspire debate, teachers have created articles and debate about our work on Challenge in the Pre GCSE years, Sixth Form teaching and learning techniques as well as reviews of research pieces on the A-Level Mindset, meta cognition and assessment. There is so much to continue learning about teaching and the staff continue to work on developing their own expertise. The Physics department has welcomed engineers from Tony Gee who came in to meet with Sixth Form students with regard to their engineering project. The students have been asked to write a report on the possibility of building a bridge between Spain and Africa. The students have been given a huge amount of information to grapple with prior to the meeting and asked questions of their link engineer in order to move the project forward. Another group of sixth formers are working with an engineer from EDF on a project linked with the nuclear industry. They have met their engineer twice now gaining a great deal of experience in the process. A third group have carried out the necessary preliminary research and have started liaising with the links who are professors at a university. One student has decided to do her Crest project that requires a lot of mathematics. Her project is looking at black holes. This student has been guided by Dr McEllin, who is also supporting two other students who are studying the effect of acid rain on plant growth. There is a great deal of activity by our students and they are the ones pushing the projects forward with enthusiasm. Many of you will have read in the local news about the sad passing of Roy Nicholas. Roy’s contribution to public life has been well documented but I would like to pay tribute to his role as a governor with us. During my time as Headteacher Roy has been a valuable member of the governing body managing to contextualise changes within the school with the history of developments in the town and county. His knowledge of local decision making was extensive and irrespective of the topic being debated he managed to anchor divergent views with the kind of common sense and clarity that few possess. He will be missed. Mrs Jacqui Philips, the Co-Chair of Governors has also put together a tribute on behalf of the governing body. "The governors are profoundly sad to announce the death of our longest serving governor, Roy Nicholas. Joining the Board of Governors in the mid-1980s when his daughter was a student at SHS, Roy was one of the founding signatories of our academy. Keenly interested in education and the opportunities that our school could offer, Roy moved from governance in a number of local primary schools to join SHS and spent time as vice chair and chair of Finance and Premises committees respectively. 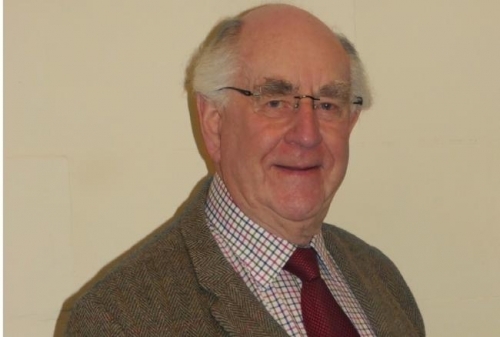 As Councillor Nicholas, Roy was a Parish Councillor in Minchinhampton for over half a century, its chair for 18 years and latterly was vice chair; he was chair of Stroud District Council in the 1980s, and also served as a County Councillor. Involved with many charities, Roy was our representative on the Stroud and Rodborough Educational Charity for many years. Roy Nicholas was a giant of a character, a plain speaker, a dedicated public servant and a friend and supporter of Stroud High School. He will be sadly missed by all." J P (Picture courtesy of Stroud News and Journal). As ever, should you have any questions or wish to book a time to come and talk about the school and your experiences do not hesitate to contact me on head@stroudhigh.gloucs.sch.uk.